We’d love your help. Let us know what’s wrong with this preview of Pig the Winner by Aaron Blabey. Pig was a pug and I'm sorry to say if he didn't come first it would ruin his day. Won't he ever learn? Pig, the world's greediest Pug, won't play fair. He'll do anything to win! To ask other readers questions about Pig the Winner, please sign up. I'm confused. After the Pig falls in the bin, "These days it's different . . ." Choking didn't phase him, but falling in a trash can gave him a change of heart? Did he suffer memory loss from the fall and suddenly "plays to have fun." Yet, at the end, he is still a cheater. This is one horrible dog. I love Pig the Pug and his new story is just as hilarious as the first two. I can't wait to read this to the kids at school - I have bought multiple copies because I just know that it will be a very popular library book! My favourite of all Pig the Pug stories. I LOVE PIG THE PUG. Made me laugh outloud. Don't know why. Perhaps Pig reminds me of someone? I mention no names. We all know children (and adults) who are very competitive and need to win to be happy. This book is about a pug who has to win or he throws a fit, screams and sulks. Where the book goes wrong for me is at the end. For those who care, *Spoiler Alert. * Pig, the pug, is so intent on finishing his bowl of food before his friend Trevor, that he cheats by yelling "go" before Trevor is ready. Then he is eating so fast that he swallows the bowl and begins choking. Trevor saves Pig, but the only thanks We all know children (and adults) who are very competitive and need to win to be happy. This book is about a pug who has to win or he throws a fit, screams and sulks. Where the book goes wrong for me is at the end. For those who care, *Spoiler Alert. * Pig, the pug, is so intent on finishing his bowl of food before his friend Trevor, that he cheats by yelling "go" before Trevor is ready. Then he is eating so fast that he swallows the bowl and begins choking. Trevor saves Pig, but the only thanks he gets is Pig yelling, "I win!" The bowl bounces back knocks Pig into the bin, which appears to be a trash container. Ok, now according to the story, that one action-- the bin, not the choking, has now caused Pig to relax and have fun and not have to always be the winner. If that's not crazy enough, the last page shows Pig the pug cheating. 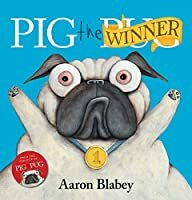 Blabey, Aaron Pig the Winner. PICTURE BOOK. Scholastic Press, 2017. $15. Pig the Pug is obsessed with winning. He is neither a good loser, nor a good winner, instead he is a whining braggart. Trevor tries really hard to be considerate, but even eating is a full body win-at-all-costs proposition for Pig. When things go awry, maybe (?) Pig has learned a lesson? There are certainly those kinds of kids in every classroom – kids that want to win at all costs. This is not the book to help nudge them in Blabey, Aaron Pig the Winner. PICTURE BOOK. Scholastic Press, 2017. $15. There are certainly those kinds of kids in every classroom – kids that want to win at all costs. This is not the book to help nudge them in the right direction. Pig’s antics are mildly amusing, but its one of those books where the lesson learned is actually spoiled on the last page. If you are a fan of pugs, you might enjoy it more. Pig the Pug loves to win. But more importantly, he cant stand to lose. He will do whatever it takes to win at all times! Pig will always find a way to win, even if it means cheating. Often times, Pig chooses to whine and pout until he gets his way. As you might have guessed, this annoys Pig's friends. When Pig challenges his friend Trevor to see who can eat their food the fastest, Trevor tries to tell Pig that he doesn't want to, but before he can even finish what he is saying, Pig is already sc Pig the Pug loves to win. But more importantly, he cant stand to lose. He will do whatever it takes to win at all times! Pig will always find a way to win, even if it means cheating. Often times, Pig chooses to whine and pout until he gets his way. As you might have guessed, this annoys Pig's friends. When Pig challenges his friend Trevor to see who can eat their food the fastest, Trevor tries to tell Pig that he doesn't want to, but before he can even finish what he is saying, Pig is already scarfing down his kibble. Pig eats so quickly he accidentally chokes on his dog bowl! Luckily for Pig, Trevor knew exactly what to do and was able to save him from choking. Its because of Trevor's help, Pig realizes the how wrong his actions were. The overall theme of Pig the Winner is learning how to play fair, and being okay with losing. The reader watches as Pig cheats his way to the top all the way to Pig having the realization of his wrongdoing. I enjoyed reading this book because the colors and illustrations brought me back to elementary school. As I read the book I found myself wondering, "Why do Pigs friends play games with him if he always acts this way?". As I finished the book, I thought that it was heartwarming that his friends stuck around to help him learn to be better instead of just not playing with him all together. In Pig the Pug's third book Pig is off to his rambunctious ways once again. Pig has to be the winner, and he'll make sure that happens. Whether it's cheating, or throwing a fit Pig finds a way. In the end Trevor saves him and he's not fazed. Getting hit into the bin changes his mind and now Pig lets Trevor win every once in a while..
Is winning the most important thing to you? Write in your journal a time when you played a game and were the winner. Was it important not to brag? Explain what it f In Pig the Pug's third book Pig is off to his rambunctious ways once again. Pig has to be the winner, and he'll make sure that happens. Whether it's cheating, or throwing a fit Pig finds a way. In the end Trevor saves him and he's not fazed. Getting hit into the bin changes his mind and now Pig lets Trevor win every once in a while..
Is winning the most important thing to you? Write in your journal a time when you played a game and were the winner. Was it important not to brag? Explain what it felt like to win, and your feelings after. This is a great series. All the Pig the Pug books are great and my son laughs all the time because of them. In this book, Pig is the winner and no one better tell him otherwise. Poor Trevor, the wiener dog, never gets a break and must go along with Pig as the winner or Pig will go into a pink fit! Although Pig cheats, he still says he won, but I wonder if his mind can be changed? Have fun reading! Pig the Winner came in the mail before the Scholastic book fair as a preview. I had the students vote for which book they would like me to read from the box and Pig won hands down. This last week I read it over 10 times to classes between k-4th grade. It's funny. It's a very funny book. I think Blabey must have good timing - the pages were set up just right to make the kids laugh out loud. The only thing that might make this book better would be a short Youtube video of a pug having a tantrum. Pig the Pug is at it again! This time he just has to win! We all know a kid like this--one who throws tantrums when he or she doesn't win--and your students do too. In the end, Pig learns his lesson, well...mostly. The illustrations are bright, silly and engaging. They compliment the text well. This will be a great addition to a school library in the "developing character." Pig the Pug must win at everything (even by cheating) or he pitches a giant fit. He eventually learns that winning isn't everything, although how he learns this lesson wasn't developed very well. Kids will love and teachers will use to help show kids how to win (or not) with some semblance of grace. Our obnoxious pug is back! Pig the pug needs to be #1. Always. And he's not above cheating to get the job done. Poor Trevor. We all know someone obsessed with winning at all costs. The expressive illustrations are hilarious and the rhyme is jaunty. More Pig the Pug please. If Pig doesn't win honestly, he cheats. If Pig doesn't win altogether, he throws a tantrum until everyone else concedes. Trevor, his friend, only wants to have fun, but Pig insists "It ain't no fun till I've WON!" During my recent Book Fair a group of 1st Grade boys were huddled around the book and cracking up over the illustrations. Great book to read to a child having a hard time accepting the fact they don't always have to win. Pig is a pug and he LOVES to win. If he doesn't, he will throw a fit. Or - even worse - he will cheat. Of course, sometimes things do not go quite the way Pig expects. And he might need a little help from his oh-so-patient friend. 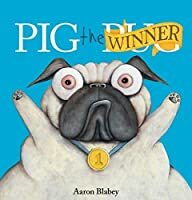 Pig the Winner is a hysterical book about a dog that hates to lose and always has to win. He learns a big lesson about the consequences that can come with that. The illustrations are very cute, written in rhyming fashion, and is a cute read-aloud to children. Pig the Pug is back with his buddy, Trevor, and he's really being mean this time! Pig has to win at everything, even if it means cheating! The kids giggled through read and read of this one even more loudly than the first. Pig the Pug...ugh! We do love him. Weirdly educational, and of course entertaining. I cannot think of any other picture book I've ever seen that features an example of dog-on-dog use of the Heimlich maneuver to save a life. Seriously? The Dachshund (Trevor) performs the Heimlich on the Pug (Pig). YES, please! Pig the pug is back in this comedic tale about contests, friendship and being a good sport and a good winner. This book was rather short, but extremely funny. The images really made the story, with the characters silly faces and ridiculous actions played out. This would wonderful for younger children, since it is exciting and would hold their attention. In the field of acting, he is probably best known for his lead roles in two television dramedies, 1994's The Damnation of Harvey McHugh, for which he won an Aaron is an Australian author of children's books and artist who until the mid-2000s was also an actor. His award winning picture books include Pearl Barley and Charlie Parsley, The Ghost of Miss Annabel Spoon and the best-selling Pig the Pug.